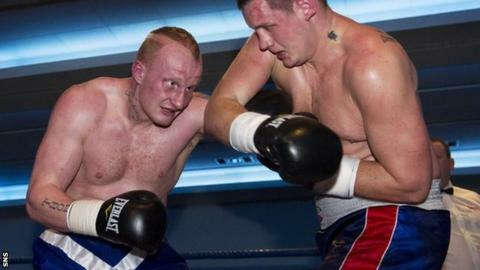 Busy Cornish a "work in progress"
Inverness heavyweight Gary Cornish will have better nights than on Monday, when he secured his 12th consecutive win by outscoring Hungary's Tamas Bajzath. Cornish, 25, was never in danger of losing the bout at the St Andrew's Sporting Club but he did not manage to stop his burly, sluggish opponent. "It went all right, not as well as I could have boxed," admitted the 6ft 7in fighter after his 60-53 points victory. "He was a bit short so I didn't really get my shots off. "These boys are in here to survive, not to fight, so it went as well it could go. "I thought he was away at one point. The referee jumped in a bit quickly, I thought. These things happen." Cornish is trained by Laurie Redfern, now in his 17th year at Inverness City Amateur Boxing Club. He, too, acknowledged his boxer did not hit top form but pointed out that, with Cornish's father being admitted to hospital, he could be forgiven for lacking complete focus on the bout. "In normal circumstances, Gary would have stopped that guy no bother," said the veteran coach. "He had done all the training but his mind wasn't on it. It wasn't our best performance. He should have sustained his attacks." Redfern believes Cornish is currently the busiest boxer in Britain, as the pair, with manager and promoter Tommy Gilmour, try to build his fight experience - and a solid record of wins to make him a credible title challenger. Remarkably, Cornish has fought only 21 bouts in total, with nine amateur bouts prior to joining the paid ranks where he now has 55 rounds under his belt. "He fought in December, he boxed in January and he's boxing again in February," said Redfern, 65. "But Gary loves training. He loves being pushed. He is a very good runner, which is unusual because heavyweights tend to be lazy big guys because they are carrying all that weight. "The potential is there. It's just getting it out. If we get him to the 20-fight mark we could hopefully go for a British or Commonwealth title. "David Price might move on to the European title next and give up his British or Commonwealth title. "It would be great if we could get Gary in a position to go for one of those." Cornish, who still holds down a full-time job, told BBC Scotland that his plan is to fight as many as 10 bouts this year. "I've got another fight in three weeks' time. I just want to keep busy and learn," he said. "We are just a work in progress at the moment. The knockouts will come later on. We are just trying to build up just now." Cornish and Redfern head to Sunderland in the coming days to spar with Jon Lewis Dickinson. Last September they ventured to France to do 52 rounds of sparring with a boxer going for the French heavyweight title. Dickinson will take on David Dolan for the British cruiserweight title on 15 February, with the Scot on the undercard. "The plan this year is to spar with all kinds of heavyweights all over the country, all over the world, just to get experience," added Cornish. "I'm just going to take it one step at a time. I'm still doing the joinery. If the money gets better maybe I could go full-time." It is 31 years since Redfern trained his first champion, Gilbert Ambrose, to the Scottish featherweight title at the Magnum Centre in Irvine, beating David Savage senior. The Liverpudlian feels he wants to see Cornish lift a title before he could contemplate retiring from the sport.